Presidio Inspector El Marqués de Rubí by José Cisneros. Courtesy of Texas Beyond History and the University of Texas at Austin. Image available on the Internet and included in accordance with Title 17 U.S.C. Section 107. 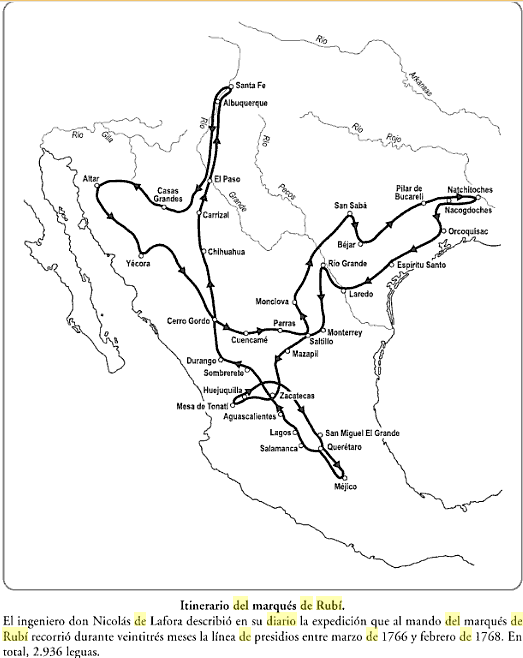 Map of the Marqués de Rubí Travels in Texas and Mexico. Image available on the Internet and included in accordance with Title 17 U.S.C. Section 107. RUBÍ, MARQUÉS DE (ca. 1725–?). The Marqués de Rubí, Cayetano María Pignatelli Rubí Corbera y Saint Climent, Barón de Llinas, was probably born in Barcelona around 1725. He was the son of Francisco Pignatelli y de Aymerich, a lieutenant general of the Kingdom of Aragon and ambassador to France and María Francisca Rubí Corbera y Saint Climent, second Marquesa de Rubí and Baroness of Llinas. Rubí, who had achieved the high rank of field marshall and knight commander in the Order of Alcántara, arrived at Veracruz on November 1, 1764, as part of the expedition of Juan de Villabla, who had been sent to New Spain to organize regular army and colonial militia units. On August 7 of the following year, King Carlos III appointed Rubí inspector of frontier presidios and commissioned him to remedy economic abuses and other urgent matters. When notified of his commission, Rubí went to Mexico City in mid-December 1765, and remained in the capital until March 1766, when he received his instructions from Viceroy Cruillas. On March 12 Rubí set out on his inspection, traveling first to Querétaro and then to Zacatecas. On April 14 he was joined at Durango by Nicolás de Lafora, his engineer and mapmaker, who kept a diary of the tour, as did Rubí himself. Discovery of a copy of the heretofore unknown diary of Rubí came in 1989, when it was found in a volume of bound documents acquired by the Barker Texas History Center at the University of Texas at Austin. Rubí began his inspection tour in New Mexico, moved to Sonora, and then traveled eastward to Coahuila. He crossed the Rio Grande in July 1767 and proceeded to San Luis de las Amarillas Presidio (San Sabá) by way of the upper Nueces River, where he visited the largely failed missions at El Cañón. He left San Sabá on August 4 and reached San Antonio de Béxar on August 24, 1767. From San Antonio, Rubí traveled to Los Adaes and began his inspection there on September 14. Subsequently, he also inspected the presidios at El Orcoquisac and La Bahía before leaving Texas at Laredo in November 1767. In all, Rubí's inspection of the northern frontier from the Gulf of California to Louisiana occupied him for twenty-three months, during which he traveled an estimated 7,600 miles. Front page from diary of the Marqués de Rubí, made during an inspection tour of presidios in Texas and the northern frontiers of New Spain between 1776 to 1768. Courtesy of Texas Beyond History, the Center for American History and the University of Texas at Austin. Image available on the Internet and included in accordance with Title 17 U.S.C. Section 107. 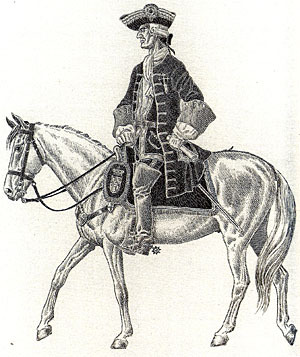 Historical Maker of the campsite of Marqués de Rubí, 1767. Courtesy of Marlon and Steve Photography. Image available on the Internet and included in accordance with Title 17 U.S.C. Section 107. As a result of his inspection, Rubí recommended that Spain reorganize its frontier defenses along a cordon of fifteen presidios, each about 100 miles apart, that would stretch from the Gulf of California to the mouth of the Guadalupe River in Texas. Above this "real" frontier, which closely approximated the present international boundary between the United States and Mexico, Rubí advised that only San Antonio and Santa Fe be maintained, and he urged the complete abandonment of East Texas. Finally, because of their perfidy and duplicity, Rubí recommended a war of extermination against the Lipan Apaches. He was back in Mexico City by February 1768, and he filed his official report on April 10. More than four years passed before a royal order commonly known as the New Regulations for Presidios was issued, on September 10, 1772. The New Regulations had enormous impact on Texas. They called for the abandonment of all missions and presidios in Texas except for those at San Antonio and La Bahía; the strengthening of San Antonio by designating it the new capital of Texas; the removal of soldiers and settlers in East Texas; and the implementation of a new Indian policy aimed at establishing good relations with the northern nations at the expense of the Apaches. With respect to East Texas, Rubí's recommendations were enacted in 1773 but were soon vitiated by the return of settlers to the region and the founding of Nacogdoches in 1779. After he sailed from Veracruz in July 1768, the remainder of Rubí's life is largely obscure. He was summoned to court in 1769 to defend his proposals, and he was in Barcelona in April 1772. When Carlos III died in 1788, Rubí may have accepted retirement at about the age of sixty-three. Donald E. Chipman, Spanish Texas, 1519–1821 (Austin: University of Texas Press, 1992). Luis Navarro García, Don José de Gálvez y la Comandancia General de las Provincias Internas del Norte de Nueva España (Escuela de Estudios Hispano-Americanos de Sevilla, 1964). Rubí Diary, Thorn Family Spanish Colonial Documents Collection, Dolph Briscoe Center for American History, University of Texas at Austin. 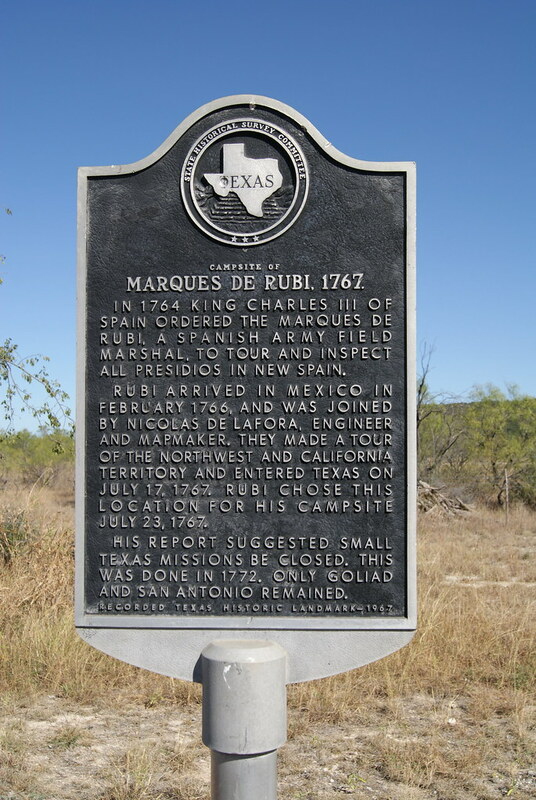 Handbook of Texas Online, Donald E. Chipman, "RUBI, MARQUES DE," accessed April 21, 2019, http://www.tshaonline.org/handbook/online/articles/fru01.